The pet rabbit as we know it today originated from the wild rabbits of Europe and Africa. We began domesticating rabbits in the Middle Ages. They are fragile animals and are most active in the morning and evening. They prefer to sleep during the day and through the night. Rabbits have different life expectancies depending on the breed and can live as little as 5 years or as long as 15 years. Rabbits and hares are not the same although they can breed. Hares are generally larger, have longer ears and longer hind legs. Hares are born with a full coat of hair and their eyes open. Rabbits are born hairless and with their eyes closed. Hares hide in plants while rabbits hide in burrows or depressions in the ground. Hares prefer being alone while rabbits enjoy the company of others. Rabbits are very tame and not demanding. They can be trained to learn commands and play games even be trained to use a litter box. Rabbits make very little noise so bothering your neighbors will not be a concern. Rabbits love to be handled, like attention, and tend to be active when most people are home. Because of all these attributes they can make an excellent pet. 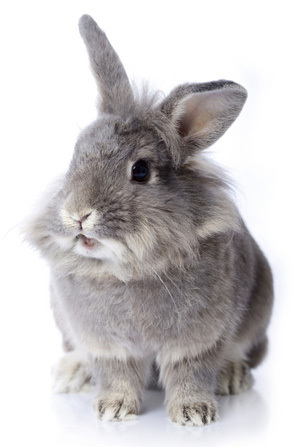 Information on the supplies necessary to care for your pet rabbit. Information on the proper diet required for your rabbit. A guide to the type of home your pet needs and the maintenance required. Information on common health problems and illnesses that could affect your bunny. Sexing, pregnancy and breeding your pet rabbit as well as caring for baby rabbits.